I have been busy beta-testing course materials for several of the new offerings in the Coursera Data Science Specialization series sponsored through Johns Hopkins University. I have been involved with the Coursera MOOC platform since its beginnings in 2012. I was asked to participate in the beta test of The Data Scientist’s Toolbox, R Programming, and Getting and Cleaning Data classes. UPDATE! 2/16/2014 – I was asked by Coursera to beta test three new classes in the Data Science Specialization: Statistical Inference, Exploratory Data Analysis, and Reproducible Research. UPDATE! 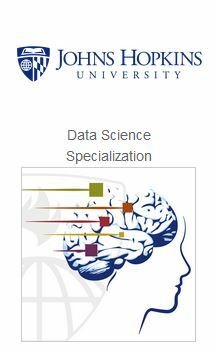 4/15/2014 – I’m excited to be asked by Coursera to beta test the last three new classes in the Data Science Specialization: Regression Models, Practical Machine Learning, and Developing Data Products. UPDATE! 5/27/2014 – I was asked by Coursera to serve as a Community TA for the up-coming Practical Machine Learning class starting June 2. This a great class for newbie data scientists. The specialization series has since been publicly announced by Coursera and is now open for enrollment. Enroll now by clicking HERE. After several months of discussions with PromusicDB, the professional music database, I have joined the team to provide data science services in support of the organization’s desire to preserve the legacy and contribution of professional musicians and music creators through the development of a standardized, authenticated online music reference resource. ProMusicDB endeavors to become the “Smithsonian” for music in the digital space, to engage music fans, professionals, and educators and help musicians be discovered as the integral part of history and culture they are. I will be providing machine learning technology solutions to increase the value of their growing data assets.